Use of any software made available for download from this system constitutes your acceptance of the Export Control Terms and the terms in the Toshiba end-user license agreement both of which you can view before downloading any such software. Many users would like to have Windows XP on their machine installed instead the preinstalled Windows Vista. when trying to install Windows XP on a newer machine with an "SATA AHCI controller", the harddisk would not be recognized. Windows XP has no SATA drivers included on the setup CD and the HDD would not be recognized from the installation wizard. 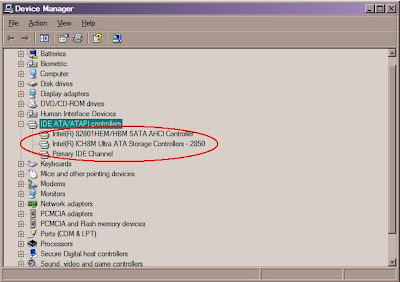 This tutorial describes step-by-step how to integrate the SATA AHCI controller driver in a Windows XP Setup CD to install XP on a machine which is equipped with an SATA AHCI controller. By creating this special Windows XP SP2 Setup CD, it will not be necessary to load the driver from an external USB floppy disk drive during the installation procedure (by pressing "F6") which is necessary to enable SATA AHCI support for the installation wizard of the operating system. A Genuine Windows XP CD (Home/Professional) with Service Pack 2 integrated. In case of no integrated Servicepack 2 on the Windows XP Setup CD, you can integrate it with the below mentioned tool. Slipstreaming tool which integrates the drivers on the Windows XP Setup CD. Attention: The filenames in this tutorial are for a system with an "ICH8M SATA AHCI controller" and must not match the drivers and chipset of your system. To find out which chipset is installed in your system, right-click on "My Computer" -> left-click on "Properties" -> left-click on the tab "Hardware" -> left-click on "Device Manager" and scroll down to "IDE ATA/ATAPI controllers" -> left-click on the square to expand the tree and check which chipset is installed.